WELCOME to the Sunburst Soap Company. Are you GOING GREEN ? Looking for something as natural as possible? Then look no further. All of my soaps are made with natural ingredients like fresh goat milk, honey, free range eggs, fresh fruit and veggies and are good for your skin. Just what is soap? Soap is what happens when lye ( sodium hydroxide), water or milk and oils are heated up and combined together. The process is called saponification. Why should you buy my soap when you can buy soap at the store? You are NOT buying soap at the store. Unless it has the word "SOAP" on the label, its not SOAP! Most so called "soaps" are really beauty bars or deodorant bars. They are full of chemicals that are drying to your skin. Handmade soap is very moisturizing because of the oils that are added and the glycerin that is left in the soap. This glycerin is left on your skin and "draws" moisture to your skin. Using handmade soap leaves your skin feeling soft and smooth all day long. This soap is rich and creamy and very moisturizing for your skin. Does handmade soap bubble? Yes, most of my soaps are VERY bubbly. I do sell some soaps that have more lather than bubble and that is because of the extra olive oil. These soaps are VERY moisturizing and good for dry skin. Are animal fats used in the soap? NO! I do not use ANY animal fat in my soaps. I only use four oils; coconut, olive, palm and castor. I also use other oils and butters for superfatting that are animal free. Have a question about my soap? Drop a line on my blog! Do you hate shower soap film? Use my soap and you'll be happy to find that the shower soap film is gone. That's right, handmade soap leaves no soap film in the tub or shower. Below are the products I am currently selling. 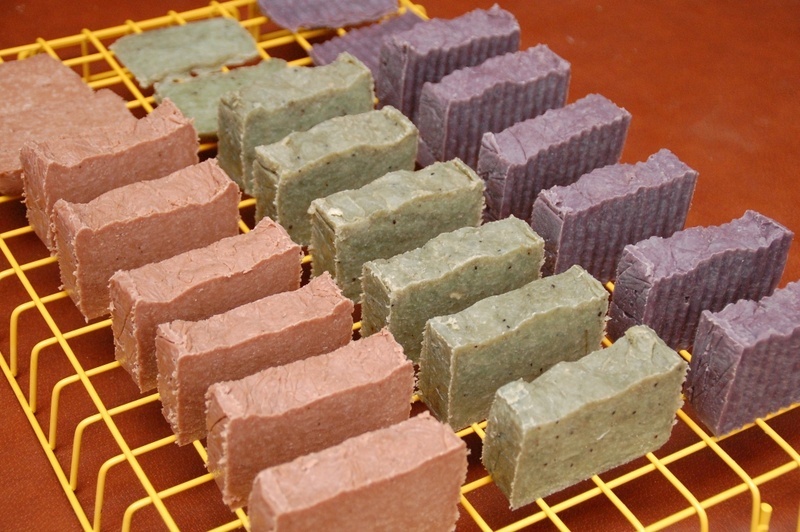 All Hot Process soaps are $4.00 each or 4 for $15.00. With the Frequent Buyers Card you get 1 free bar after purchasing 16 bars. (note: prices have changed due to the raising shipping costs, sorry. Salt Scrubs are $6.00 for 6 oz or 2 for $10.00 and $12.00 for 12 oz or 2 for $20.00. New at the market.... "Bangles and Bubbles"
I'm making "Pandora" style bracelets and you can purchase them by themselves or with a soap. Makes a great gift and you can match the bracelet to the soap. example...Ocean Breeze soap with a bracelet that has ocean/beachy type charms and colors. Stop in and check them out, oh, don't forget to print the coupon for a discount. You may look at the soaps on this page or enter the store to shop below. There are many new soaps on the webstore. Be sure to check out the new "Food Soaps". NOTE: most of the soap is made fresh when ordered so please allow 3 to 4 days for soap without goatmilk and 1 week for goatmilk soap. If ordering for gifts, please keep this in mind. Thank you. NOTE: please read all ingredients to check for any possible allergies. I use nut oils, honey, oatmeal, fresh fruits and vegetables, eggs and milk products. I have a Punta Gorda Line of soaps now. These soaps are named after things that have to do with Punta Gorda. Punta Gorda Pineapple- a mouth watering pineapple scent mixed with a hint of spearmint. This soap is yellow on the bottom and has a green top with peppermint leaves mixed in. Maid Marion-named after Marion Ave. this bright pink soap is a best seller. Has a light floral scent with hints of an Asian flair. Shell Creek Orange- another best seller, this orange soap smells just like fresh cut oranges. A great scent for the citrus lover. Wealthia's Tea Rose- named after my mother who was born in Punta Gorda, this scent is also another best seller. A light old fashion rose scent that smells like a victorian rose garden. Cracker Cowboy- this soap takes you back in time to a cowboys tack room. If you smell this soap, you will smell leather, a metalic scent like a gun and a hint of cracker rose. A great soap for the cowboyor girl in your life. Tarpon Spirit- this soap is of course for the home team, the Tarpons! Go Fish!! Colored blue and gold with an ocean scent its a must have for that CHS student or yourself. Bee my Honey- made with real honey and molded in a honeycomb wrap. This soap smells real good. Patchouli - need I say more. The classic 1960's scent, mixed into a goat milk soap for a wild time in the shower. Cool Water- a mans scent that just smells nice. 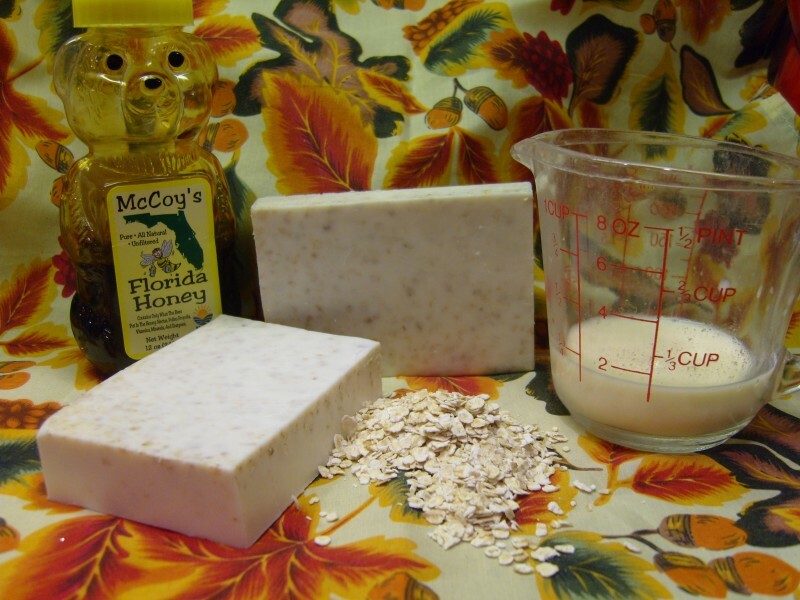 This soap is made with fresh goat milk, honey and oatmeal powder and is also made with coconut oil. This soap smells awesome and is so good for your skin. It has tons of bubbles and has no added color. Made with: coconut oil, olive oil, palm oil, castor oil and avocado oil. The bars weigh 4.5 oz to 5.5 oz. HOT PROCESS SOAP: Sunday Sermon- Remember the smell of incense in church? This soap is lightly scented with Frankincense & Myrrh and warm vanilla sugar for an exotic aroma. Made with coconut, olive, palm and castor oils with cocoa butter and oatmeal added. This soap is hand cut and the bars weigh 4 to 6 oz. Do you have hard water? If you do then your soap will not bubble like it would if you had soft water. If you have soft water, you have nothing to worry about! How to care for your soap: Weasel says: "never leave natural soap sitting in water or where the shower spray will hit it." "Keep your soap in a raised soap dish or in the soap holder in your shower." This will let your soap "dry" out between uses and last longer. COTTON BLOSSOM-Hot Process- This hot process soap smells just like the Bath & Body Works scent. It has a nice light floral scent with undertones of clean laundry. A fresh, crisp, clean scent. If you like light floral scents, you'll like this soap. Made with olive,coconut, palm and castor oils and rice bran oil. The bars weigh 4.5 to 5 oz. COCONUT LIME VERBENA-Hot Process- This soap is made with coconut milk. The scent smells great a coconut, limey, creamy smell. Its wonderful. Another Bath & Body Works scent. This soap is made with olive,coconut, palm and castor oils. The soap weigh between 4 oz. and 5 oz. Beer? Yes beer. Beer because its made with grains is very good for your skin and hair. This bar can be used as a soap and then used on your hair as shampoo. Made with palm,coconut,olive, casto oils and cocoa butter with honey added, its great! It doesn't smell like beer if your wondering. Scented with lemon,lime,grapefruit & orange essential oils. The bars weigh 5 to 5.5 oz. LEMON SOAP-Hot Process- If you like lemon, then you'll like this soap because it smells like a fresh cut lemon. It has a nice strong lemon scent. A very nice refreshing soap. Made with coconut, olive, palm and castor oils. The bars weigh 4.5 oz to 5 oz. DELUXE SALT SCRUBS- Never used a salt scrub before? Oh my GOSH! You will be more than pleased with this product. Salt scrubs are an invigorating way to give yourself an at home spa treatment that will leave your skin feeling incredibly silky and your entire body energized. What does a salt scrub do? The abrasive action of the salt will remove dead skin cells and open pores, allowing them to breath. Not only does it soften, stimulate and clean the skin, it also makes it lighter and give you a healthy glow! These scrubs have added shower gel to make them bubbly and you don't have to use soap afterwards. Its like two products in one. All scrubs use dead sea salt, avocado oil & apricot kernel oil. These oils are high in Vitamin A, B1. B6, D & E. Scrubs come in 6 oz. and 12 oz. jars. The prices are $6.00 for 6 oz and $12.00 for 12 oz. Don't need a basket full of soap, why not try a soap bag. These brightly colored drawstring bags come with 1 bar of soap, a bath scrubby and a 6 oz scrub for only $10.00. May also get 2 soaps and 1 bath srcubby and a soap saver for the same price.